A standard view in the neuroscience literature is that the frontal lobes sustain our ability to process others' mental states such as beliefs, intentions and desires (this ability is often referred to as having 'theory of mind'). Here we report evidence from brain-damaged patients showing that, in addition to involvement of the frontal lobes, the left temporoparietal junction is necessary for reasoning about the beliefs of others. Fletcher P.C. et al. Cognition 57, 109–128 (1995). Gallagher, H.L. et al. Neuropsychologia 38, 11–21 (2000). Stone, V.E., Baron-Cohen, S. & Knight, R.T. J. Cogn. Neurosci. 10, 640–656 (1998). Rowe, A.D., Bullock, P.R., Polkey, C.E. & Morris, R.G. Brain 124, 600–616 (2001). 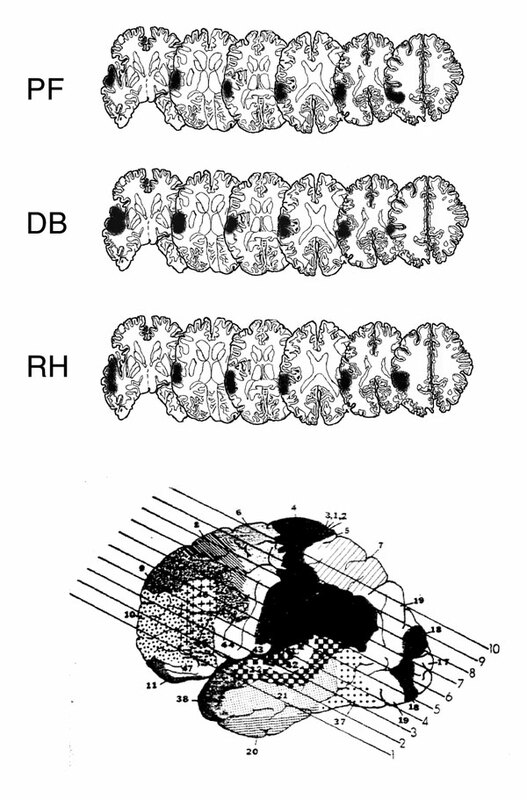 Saxe, R. & Kanwisher, N. Neuroimage 19, 1835–1842 (2003). Allison, T., Puce, A. & McCarthy, G. Trends Cogn. Sci. 4, 267–278 (2000). Frith, C.D. & Frith, U. Science 286, 1692–1695 (1999). Carlson, S.M., Moses, L.J. & Hix, H.R. Child Dev. 69, 672–691 (1998). Riggs, K.J., Peterson, D.M., Robinson, E.J. & Mitchell, P. Cognit. Dev. 13, 73–90 (1998). Peterson, D.M. & Riggs, K.J. Mind Lang. 14, 80–112 (1999). Kay, J., Lesser, R. & Coltheart, M. Psycholinguistic Assessment of Language Processing in Aphasia (Lawrence Erlbaum, Hove, 1992). Burgess, P.W. & Shallice, T. The Hayling and Brixton Tests (Thames Valley Test Company, Bury St. Edmunds, 1997). Baron-Cohen, S., Wheelwright, S. & Jolliffe, T. Vis. Cogn. 4, 311–331 (1997). Baron-Cohen, S., Wheelwright, S. & Hill, J. J. Child Psychol. Psychiatry 42, 241–252 (2001). This work was supported by grants from the Economic and Social Research Council, the Stroke Association and the Medical Research Council (UK). We thank all the patients for their participation as well as the reviewers for their comments. Dana Samson and Ian A Apperly: These authors contributed equally to this work.